Many Vancouver car buyers have the same problem: their city might be beautiful, but their credit report — well, not so much. Thanks to our car loan service, bad credit auto loans are now easy to get in Vancouver. We match up drivers who have bad credit with lenders and dealers who specialize in providing bad credit financing. Applying for a car loan only takes a few minutes. Bad credit or no credit? You can still get a loan. Only the dealership sees your info. No one else. Our car loans range from $5,000 to $40,000. We offer market-competitive rates in Vancouver. I just moved to Vancouver from another country. Can I qualify for a car loan? Yes. We work with drivers from other countries who haven’t had a chance to establish a credit history in Canada. I went bankrupt and ruined my credit. Can I still get a car loan through your site? Yes. The lenders and dealers in our Vancouver car loan network serve all drivers — even those with bad credit or no credit. What do I need to qualify for a car loan in Vancouver? You need to be employed and have a minimum monthly income of $1,500. You also need to be 18 or older and have a valid driver’s license. What are the benefits of buying a car from a licensed Vancouver dealer? Licensed dealers usually offer great financing options that can help you get on the road, fast. Dealers also have to follow strict provincial regulations that protect consumers. For example, according to the Vehicle Sales Authority (VSA) of British Columbia, dealers have to disclose the car’s history and inform you of certain damages. Does LowestRates.ca only work with specific car dealerships? Yes. We work with an exclusive network of Vancouver dealerships who offer financing to drivers who would have difficulty getting an auto loan from a bank. Is the advertised price of a vehicle the price you pay? It’s supposed to be. Under provincial law, Vancouver dealers are required to disclose the total price for a vehicle in all advertisements. Extra fees must be included in the total or stated elsewhere in the advertisement, like in the fine print. In other words, the dealer can’t bill you for fees — other than sales tax — that weren’t listed in the original ad. How much tax do I have to pay on a vehicle purchased in Vancouver? You’ll have to pay both GST and PST if you buy a vehicle from a licensed car dealership in Vancouver. GST is 5% and PST is 7% for vehicles that cost $55,000 or less. On the flipside, if you buy a used vehicle from a private seller, you won’t be charged GST, but you will be charged 12% PST. Should I choose a long car loan term or a short car loan term? That depends on how big of a monthly payment you can afford. A long car loan gives you more time to pay off your principal balance, which gets chopped into smaller amounts that seem more affordable. That’s not really the case though — a long loan is actually more expensive because you’ll pay more interest. If you can afford larger payments right now, choose a short loan. A short car loan breaks your principal balance into bigger, but fewer, monthly payments. You’ll get rid of your loan faster and pay less interest. 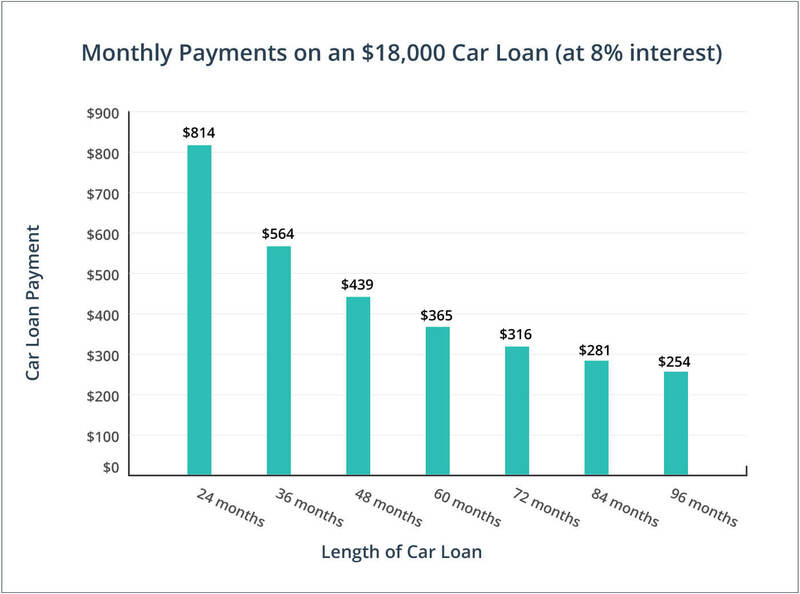 Check our graph below to compare monthly payments for an $18,000 car loan at 8% interest. Apply for your loan before you shop for a car. Our car loans start at $5,000 and go up to $40,000, so you won’t know what your actual budget is until you secure financing. Have a professional, unbiased mechanic inspect the vehicle. You can also conduct your own inspection: perform a walk-around, check the tread on the tires, and look out for dents or rust. Learn more about the car’s safety features, fuel efficiency, and overall performance and reliability. If you’re buying a used car, remember to also look up its vehicle identification number. The VIN history will show you if the car has been in an accident. In Vancouver and the rest of BC, all vehicle fees are supposed to be included in the total advertised price, but you should always confirm the numbers. The total price should include the dealer and documentation fees, plus any inspection, pre-delivery, or transportation charges. The Vehicle Sales Authority of BC regulates all car sales in Vancouver. False. The VSA only regulates sales associated with licensed car dealerships. Private sales (i.e. between individuals) aren’t regulated by the VSA. So if you buy a vehicle from friends, family, or an online seller, you won’t be protected by the Motor Dealer Act or the Business Practices and Consumer Protection Act. PST doesn’t apply to cars purchased solely for business use. False. You have to pay PST on all car sales in Vancouver, regardless of whether or not the car is intended for business or personal use only. The Automobile Protection Association (APA) went undercover in Vancouver during the winter of 2016 to keep dealers in check. Secret APA shoppers visited 20 Vancouver dealers and shared their findings with the public. Good news: car loan delinquency rates are falling. The number of Vancouver consumers who were late on credit card and loan payments dropped by 7% in Q4 2015. Find out where your car’s coming from. Vancouver dealerships are required to tell you if a vehicle was ever used as a lease, rental, taxi, or emergency vehicle. Vancouver isn’t anti-car, but sometimes drivers (and the roads) need a break. That’s why Car Free Day is in its 12th year in Vancouver. In celebration of walking and cycling, the city closed major roads for one day in June 2016.